Under the Oak Tree: What's the water like? 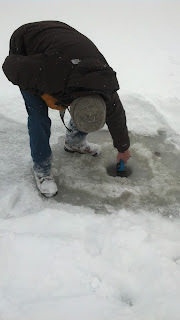 A couple weeks ago our pond experts Richard and Dave came by to conduct testing on our 4 Winds Pond. 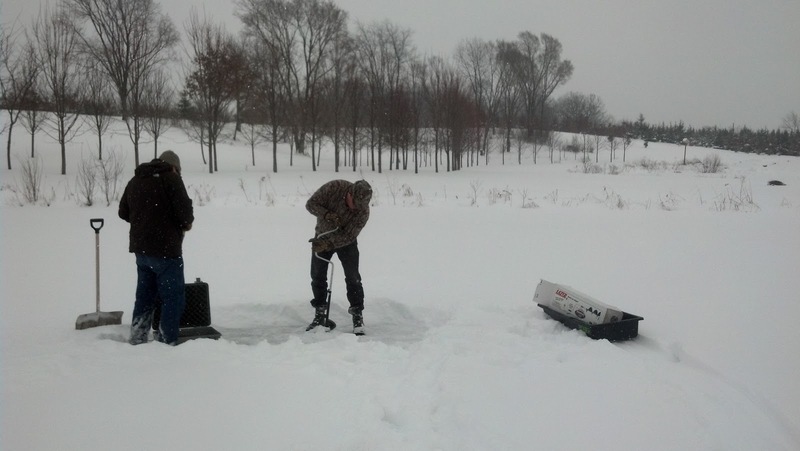 With all of the snow we had just received, it took some time to get down to the ice. And of course snow was falling all the while. In the photo below, Richard is auguring the hole while Dave is preparing the testing equipment. I am staying nice and toasty warm while watching them work. I will say my fingers did get cold taking photos. 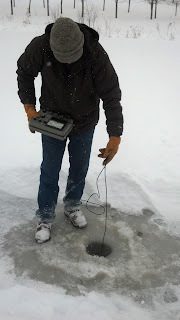 While we dug a hole to measure the water depth, Dave's device can actually measure through the ice. Thus, they recommend we use an aerial photo of the pond printed on grid paper and Dave's device to create a topographic map of the pond. Understanding the topography (or terrain at the bottom) of the pond will inform and direct how we go about excavating the pond. In 4 Winds Pond, multiple depth levels are preferred. I might sound smart about this, but I am simply relating what our experts told me. I am sure that the device Dave is using in the photo above has a long and very important sounding name. It's just that I forgot to ask him what it is. However, I can tell you what it measures. With this tool the guys recorded water temperature, dissolved oxygen levels, alkalinity, and pH. I don't expect I need to say much about temperature. It would be obvious that temperature plays a bigger role in the summer months. Trout are a fish that would need colder water. Dissolved oxygen (DO) is very important to know prior to stocking fish. DO levels need to be high enough for the fish to have oxygen for fish respiration, or breathing. In the winter, sunlight can pass through the ice and aquatic plants can continue to photosynthesize That's a good thing because that would create oxygen for the fish. Late winter DO measurements show if that process is happening. 4 Winds Pond had DO readings that were very encouraging, they were high enough for fish to survive through the winter months. Alkalinity measurements help inform where the water is coming from and also the ponds ability to neutralize acids. The pH measurement is the acidity of the pond. My limnology is a bit weak so I won't write anymore on their influence on 4 Winds. We repeated the whole process at a second location on the pond. Stay tuned as the guys sort out the data and determine a plan of action for turning 4 Winds Pond into a habitat for fish.